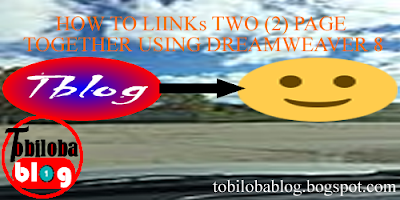 Links is the powerful tools for all web-designers, without links nothing can be called website, is with the help of links that make it possible for some one to click text/image that have already link to other page, with help of this link that lead to other page which have link to. Link is great advantages in world of webdesign and development this make it possible for website to called website. something that enables communication between people. Links is a means of contact or transport between two webpage, links involved code or instruction connecting one part of a program, website, etc. to another. 1. Select the text or image that you wish to be a link. 2. If the properties inspector toolbar is not visible, show the toolbar by selecting Window, Properties or by pressing CTRL-F3. 3. Click on the folder next to the Link box in the Property Inspector and browse to the desired file. This may be an image, a document , or another web page. If you are linking to another webpage, be sure you include the entire URL to the website.